Today's post will be a little different, but I hope you will like it, because there are more to come in this column. Here I show you the three beautiful stud earrings that I received shortly from Body Jewellery Shop. With the tiny heart I fell immediately in love. They are cute and girly. They are perfect for any glamorous outfit but they are ideal for a comfy look as well. I choose them in the colour silver, but you can find them in many other colours here. The star earrings are a little different. They are not silver like the others. They are made from stainless steel, therefore they have a grey colour. This material makes the earrings comfortable to wear, because they don't irritate the ears. Do you have earrings which are stainless? Do you feel the difference whilst wearing them? 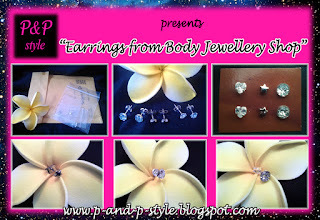 If you like jewellery, you can find many different earrings, ear piercings, belly button jewellery and other piercings on the site of Body Jewellery Shop. Go, visit them. Do you have a favourite from the site? Or have you already buy something from there? The truth is that I got a pair of earrings from that shop and they infected my ears, so I wouldn't recommend them at all!! I'm really sorry to hear that and I hope, everything is fine now.. I am wearing the star earrings since weeks, day and night, and they are comfortable to wear, I didn't had any problem with them.